The death toll of the incident at the Kerch polytechnic school has grown to 20, Kerch administration deputy head Dilyaver Melgaziyev told the press in Kerch on Thursday. "Twenty are dead. They brought four bodies from the school, instead of three we expected," Melgaziyev said. He met with the press near the city morgue where the bodies were being taken all through the night and the identification continued. 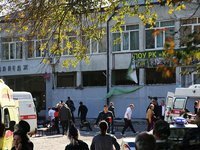 Earlier reports said that the explosion and shooting at the Kerch polytechnic school took 19 lives.